The 31st theater season of Tanghalang Pilipino embraces all that our theater company stands for: diverse, entertaining, and powerful storytelling that is rooted in centuries-old Filipino culture and history while being responsive to our evolving contemporary society. Each play takes you on a Filipino journey with a unique point of view, style and tone. It includes something for everyone, with piquant comedies, suspenseful dramas, and inspiring Filipino stories. Performances begin in June 2017 with the opening of Virgin Labfest 13: Wagas, an annual festival of unpublished, unstaged, untried and untested works for the theater held at the Cultural Center of the Philippines (CCP). 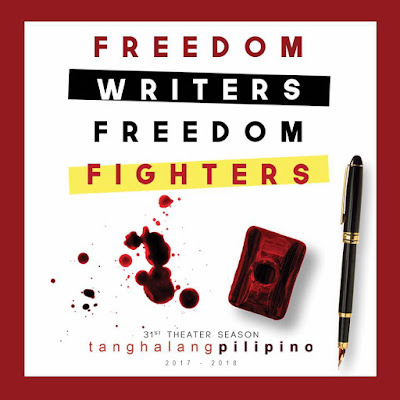 This festival is a partnership project of the The Writer's Bloc Inc., Tanghalang Pilipino Inc., and the CCP. As the season has come together, some themes have emerged and as always, they speak right to the current zeitgeist. With fresh new voices and extraordinary new plays, you will find a deeper feeling and understanding of “love for the country (and of countrymen), freedom, culture, truth, justice, goodness, nature, the beloved, and kindness” in the most unlikely places. Truly, Tanghalang Pilipino’s 31st season is a writer’s showcase altogether. Jumping off the successful threepeat run of Mabining Mandirigma, Nicanor Tiongson’s Apung Aurelio is an original musical based on the life of Aurelio Tolentino, a Filipino playwright and dramatist who writes about a Katipunero who, together with Bonifacio and Sakay founded Teatro Porvenir, a theater company where they show their patriotic sentiments. Because one of his plays called for ‘tearing of the American flag,’ Tolentino was charged with sedition and imprisoned by the Americans. Trivia: The CCP Little Theater was named after him, and this year, we celebrate his 150th birthday. Histerya (The Crucible by Arthur Miller) is a play that dramatizes how “the establishment” is used as a tool of the powerful few, exerting its magnitude on people to prevent any sense of community and collectivity from being formed. Miller’s warning is for individuals not to be afraid and to take a stand when their government is operated in a manner contrary to public interest. Trivia: The Crucible was performed in Broadway and won the 1953 Tony Award for best play. It is now considered as literary classic all over the world. Originally written for a 22-cast ensemble, the play will be performed by the 12 strong members of the Actors’ Company. Based on National Artist Nick Joaquin’s story of “(the correct explanation) why Mariang Makiling forever nurses a broken heart, and also why Juan Tamad is a pop idol, a model for the young,” this stage adaptation by Rody Vera, Nang Tamaan ng Pag-ibig si Juan Tamad is a mashup love triangle among Maria Makiling, Juan Tamad and Monte Banahaw. Trivia: Nick Joaquin worked for the release of political prisoner writer Pete Lacaba, openly fought for artistic freedom, and was blacklisted by the Marcos administration for speaking about intellectual freedom. Rody Vera’s Walang Aray is a contemporized comic version of Severino Reyes’ Walang Sugat, which was written when the zarzuela became a potent means of expressing Filipino nationalism during the Spanish Occupation of the Philippines. It was, eventually, one of the plays considered subversive by the American colonial authorities, because of which Reyes was imprisoned. Trivia: Severino Reyes was imprisoned by the Spaniards because he was suspected of being a Katipunero. Rustique Readings is a special project organized by TP chairman Tony Boy Cojuangco to create an avenue to promote Tanghalang Pilipino productions. To be held at Rustique Kitchen, our Actors Company and guest artists will do staged readings of past and current TP productions, host spoken word and mini productions to pave the way into bringing theater and the arts closer to the public. This is an opportunity for audience members to be an integral part of the process of making a new or revisited play the best it can be. After the reading, the audience will be welcome to provide feedback and ask questions, which will help the writer and director make changes and improvements. In the future, Rustique Readings may also host special jamming, poetry, orchestra, and dance sessions for a holistic artistic experience. More details to follow when announce our activities in the coming months. Show buying opportunities as well as subscriptions, season passes and group discounts are available through Tanghalang Pilipino’s hotline 832 1125 loc. 1620 or 1621. You may also contact Ms. Lorelei Celestino at 0915 607 2275 or 0908 894 1384. Tickets are available through TicketWorld at https://www.ticketworld.com.ph or 891 9999; and the CCP Box Office at 832 3704.